When done correctly a facial gua sha [pronounced “gwah sah”] can feel incredible, and gua sha facials and at-home gua sha tools are becoming more common than ever, especially after a year that saw the popularity of jade rollers skyrocket. Sometimes called the Eastern botox, or Eastern facelift for a good reason, gua sha devotees claim some pretty dramatic effects. While there aren’t a lot of scientific studies examining the potential benefits and effects of gua sha treatments, the anecdotal evidence is definitely compelling, and it’s no small thing that the ancient practice has been in use for some thousands of years now. The chronic stress of our day-to-day lives plays out on our faces as a furrowed brow or a clenched jaw. Facial gua sha can uncoil the daily buildup of stress we experience in the face. Gua Sha also enables the skin to self-hydrate and delivers color, oxygen, and nutrients to the skin all through microcirculation. This facial treatment improves the health of your skin and tissues, it helps firm, lift and tone the skin while smoothing, plumping, and brightening it for a more youthful and healthy appearance. Moreover, gua sha can also be used to treat acne or congested skin by helping to detoxify the skin. When you pair the treatment with a jade or rose quartz roller, it can promote cooling and draw heat out of inflamed skin. If you do it as often as daily or even two to three times a week, you can truly transform the way you look and feel. Facial Gua Sha is also a deeply relaxing and therapeutic treatment for your body, and it facilitates lymphatic drainage. The lymphatic system is a vital part of the immune system, and the primary role of the lymphatic system is to protect the body from outside threats — such as infections, bacteria, and cancer cells — while helping keep fluid levels in balance. Essentially, the lymphatic system is the body’s inner “drainage system,” a network of blood vessels and lymph nodes that carry fluids from tissues around the body into the blood and vice versa. You can think of your blood as the faucet and your lymph as the drains. When waste particles from the blood are too large to be eliminated by your liver, kidneys, or skin, it goes right into your lymphatic vessels. And when those “drains” are not moving efficient, stagnation and illness occur. Your lymphatic system is twice as big as your circulatory system, but while your circulatory system has your heart to pump and clean your blood automatically, your lymph has NO built-in pump whatsoever. Lymph only moves manually through massage, exercise, and diet. Gua Sha is a Traditional Chinese Medicine (TCM) practice and is the Chinese word for scraping. Gua Sha is also sometimes called skin spooning or coining. Gua Sha uses a flat, handheld tool, often made of jade or rose quartz, to apply pressure while pulling and scraping the skin to stimulate circulation, relieve muscle tension, and promote healing. If you Google “gua sha” the results will yield scary photos showing beet red human backs. That is the down-and-dirty version of the body gua sha massage that is purported to break down scar tissue, reduce inflammation, flush fresh blood flow to the skin and muscles, relieve pain, and improve joint flexibility. But when used as a facial technique, gua sha are much gentler, and should never result in bruising or blood vessel damage. Flush fresh blood flow to the skin and muscles. Help even out skin tone. Reduce puffiness via lymphatic drainage. Clear up acne and rosacea. Improve skin clarity and radiance. Firming of sagging facial muscles. Plump and brighten the skin for a more youthful and healthy appearance. And last but not least it’s super relaxing, and by the end of a treatment you might start to feel sleepy. Gua sha kits are easy to find on Amazon and elsewhere, they look smart on your make-up desk, and aren’t super expensive either. A jade or rose quartz gua sha massager. A mist, which will begin the hydrating process, by feeding your skin with water. I use my own Tantalizing Mist. An good facial oil to build suppleness and plumpness into the skin, and to create a little bit of slip for the gua sha tool. Good choices are organic extra virgin olive oil or rosehip oil. I use my own oil blend the Rich Hydrating Face Serum. Facial gua sha is like a Swiss Army knife, one tool with a dozen functions and uses. Depending on your pressure, which edge you use, your speed and direction, you can either lift or de-puff, work on surface lines or deep muscular tension. 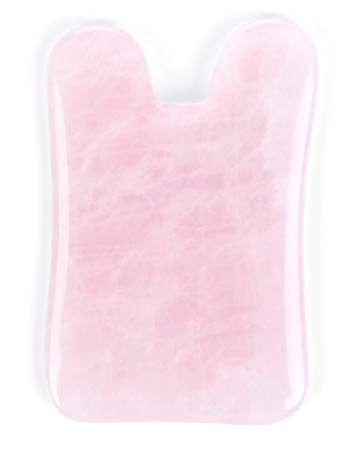 The u-shaped tools I use are good beginner tools to facial gua sha for self-care at home, they have all the right shapes and notches to do the job properly, and they’re made of rose quartz and jade. Rose quartz and jade are completely skin safe and have some skin and health benefits too. Be aware though that a lot of online stores are selling what are really acrylic tools dyed to look like crystal, so try to get a certificate of authentication from the vendors before you hit the buy bottom. This tool works with my Facial Gua Sha Tutorial. Jade or Rose Quartz – what should I choose? Stones like rose quartz and jade used along with skin care products help enhance their penetration, and the cold stone may also help constrict blood vessels, support the lymph drainage and remove fluid that accumulates and leads to puffiness in the face. While there’s still plenty of scientific research that needs to be done, crystals are believed to have different vibrations that they emit, and as stones, each one can be used to showcase a unique effect. Rose Quartz - the Heart Stone. It’s believed that this stone inspires the love of beauty. It was prized in the ancient world for its powers of physical beautification. Facial masks of rose quartz have been recovered from Egyptian tombs, as Egyptians and Romans thought it would clear complexion and prevent wrinkles. It may be helpful to soothe burns, reduce blistering, and diminish the appearance of scars. It can stimulate the proper functioning of the heart and circulatory system, and aid in relieving tension and stress, palpitations or skipped beats, and may stabilize irregular heart rhythm. Jade comes in many qualities and colors. I’ll highlight two kinds of jade. The unique dark green and sometime almost black Nephrite jade, also known as "He Tian" Jade, is rarer than the lighter green Xiu Yan Jade. In China, they regard Nephrite jade as having stronger healing resonance to the energy of the kidneys. In TCM, the health of the kidneys is foundational to overall vigor and vitality. Research has also found that nephrite has the ability to radiate far-infrared rays when topically applied, increasing blood circulation in the skin specifically. And well functioning kidneys are essential for beautiful skin. Nephrite jade gua sha tool is denser and heavier than the light green jade stone, and less prone to breakage. The lighter green Xiuyan jade is believed to help the body detoxing processed and to boost a host of therapeutic benefits. The gua sha craze is due, in part, to the fact that it’s not only very effective it’s also totally DIY-friendly — though you can absolutely get treatments at a spa if you want to, but if you’d like to add this method to your daily skin care regimen follow the simple steps below. You can do the treatment as often as daily or even two to three times a week, and you’ll truly transform the way you look and feel. A hydrating mist, to start the hydrating process. I use my own Tantalizing Mist, or a rose water mist. A facial oil. I use my own blend Rich Hydrating Face Serum, rosehip oil or olive oil. There are 3 things on the technique that you’ll need to remember through the whole routine. The correct angle of the tool is flat. As you go through each step make sure the tool is turned flat against your skin. Don’t use the sharp pointy edge against your skin. The pressure you want to use is light to medium. We’re trying to relax the nervous system, so keep the speed slow and mindful. Start out with a clean and freshly washed face. Generously spray your face and neck with the mist, then use your hands to press the water into your skin. Just like you need water, so does your skin. While your skin is still damp, pump once on your oil bottle or use 3-4 drops of your preferred oil (more than that can be too much). Rub the oil between your palms; this will help apply it more evenly. Gently press the oil on to your face and all around your neck with both palms. Work the oil in with upward massage strokes. Beauty Tip. Your face is very open to suggestions so when you massage in upwardly strokes, you are actually creating lift. Start by opening the neck. According to the TCM, whatever is going on in our face is happening in our neck. If your face muscles are tight, it’s coming from a tense neck. So the neck is a crucial area to open up and free from tension. Use the notched edge of your gua sha tool. Place the tool where your neck meets your back. Notches are pointing down and placed on each side of the spine. Use the flat edge and a light to medium pressure when you slowly stroke up the back of your neck until you reach your skull. Wiggle the tool to give yourself a massage here. Do this step 5 times or more if you like. Use the long edge of your tool. With light to medium pressure begin to pull the tool up the side of your shoulder, and up your neck until you hit your skull. Wiggle the tool here to give yourself a massage. Do this step 5 times or more, and repeat on your other side. Use the long side of the tool here. Place one hand under your collarbone. Use the other hand to place the long side of the tool right above the fingers. The tool is touching the fingers. Turn your tool flat, and slowly roll it over your collarbone, and pull it up with light to medium pressure until you meet your jawbone. Repeat the step 5 times or more if you like and then repeat on the other side. The final part of the neck is the front center. Use the notched edge for this area. Take one hand and place it on your sternum between your two collarbones. Let the notched edges meet your fingers. Hold the tool as flat as possible and lightly stroke up your neck until you meet your jawbone. Once again massage here wiggling the gua sha. Repeat 5 times or more if you like. After you’ve completed the entire neck, you move on to the face. Chose one side of your face and work through the full steps on that side before you move on to the other side. Use the notched edge of the tool. Place a finger in the center of your chin, and hold firmly there for support. Place either side of the notch on either side of your jaw. Bring your tool to a flat angle against your skin. Use light to medium pressure as you slowly follow the angle of your jaw all the way back until you meet your ear. Give yourself a massage here by wiggling the tool. Repeat this step 5 times or more. Use the long end of the tool here. Place a finger next to your nostril. Let the tool meet your finger. Make sure the tool is flat as you pull it with light to medium pressure outward and with a slight angle upward toward your ear. When you reach the front of your ear, wiggle gently here. Tip. On a couple of these strokes, you can also place the tool, so it strokes under your cheekbone, this will get some of those muscle or tissue adhesions and knots that are often under the cheekbone. Important. Use extremely light pressure under the eyes. Lighter than any other area you’ve done so far. Use the notched edge of your tool. Place your ring finger next to the inner corner of your eye. Use one of the notches, and touch your finger under your eye with it. Make sure the tool is flat as you move it with a feather-light stroke outward toward the outer corner of the eye. When you pass the outer corner, angle the tool upward past your temple. When you reach your hairline wiggle for massage again. Use the notched edge again. Place a finger between your brows. Touch your finger with the lower notch. Keep the tool flat and follow your brow bone with light to medium pressure. Turn the tool in an upward angle when you reach the end of the brow bone and move across your temple. When you reach the hairline, massage here with the wiggle. Repeat step 8 five times or more. Place a finger very lightly at the middle and under your brow bone. You’re actually touching your eye that’s why it has to be very gently. You’re just supporting the skin. Let the long side of the tool meet the finger, and lightly stroke it over the brow bone in a straight upward movement. It’s as if you gently pull the skin upward. Keep moving the tool up until you reach your hairline. Massage here with the wiggle. Step 10 – the center of the forehead. Use the short flat end of the tool. Place your finger between your eyebrows and hold it down gently. Touch your finger with the tool. Make sure that it stays flat around the curve of your forehead. When you reach the hairline, massage with the wiggle. Note that this is a stroke that passes through your third eye, which is super relaxing, and at this time of the treatment, you might start to feel sleepy. Before you move on to the other side of your face, take a moment and check the differences on the two sides of your face now. What you might notice on the side you just treated: the brow is more lifted, the eye is more open, cheek lifted, and jaw more sculpted. When you’ve done both sides, you should notice that your skin looks smoother and more even, more lifted and sculpted, but most importantly that you feel more relaxed and less tense. The more often you do facial gua sha, the more results you’ll see. Always remember to wash and store your gua sha tool properly after each use.